All the senseless but fun "forum games" belong here. Best helmet worn by a fictional character? The Lich King's Crown from Warcraft, It's so intimidating and awesome looking, that Ner'zhul decided to imbue it with his own soul. Since two days ago was May the Fourth (be with you), my question is: If you were a Force User, doesn't matter, Jedi or Sith, What would you practice? Wo dein saftner FlÃ¼gel weilt! Form VII, throw everything at it to win! 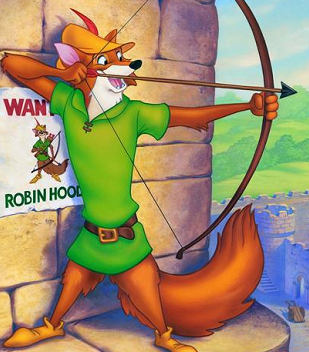 Being obsessed with medieval adventures as a kid I've always admired Robin Hood anyway - but Robin Hood as a fox? How could things get even better? Which fictional object would you pick to own in real life? If you could pick any supernatural ability, what would you choose? Which is better: Team Fortress 2 or Overwatch? What's your opinion of Toys-to-life games, such a Lego Dimensions, Skylanders and Disney Infinity? I like the idea and most of these toys I have seen so far look really nice. As a kid I'd played with them even without owning the videogame. My husbands got the first Skylander games and they looked good. But the money... Those toys are very expensive if you want to collect them and I don't like the fact that old generations often don't work with new games. So personally I would not buy them. If I had kids I would buy a started pack and see how long they are interested in this. Soon we will have space tourism. Let's say you could be part of one of the first regular SpaceX flights. Would you join a flight into orbit if you win a ticket? Which board game do you prefer: Chess, or Checkers? As a kid I have played quite a bit of Chess with my Mom and Nine Men's Morris with my Dad, but nobody played Checkers with me. I learned the rules later but at that time I was already more interested in modern boardgames. What I like about Chess is that every piece follows its own rules. But I never became good at the game. I have no clue about winning strategies and haven't played for years. Which types of board games do you enjoy most? The old classics, family games, party games, card games, strategy, "Euro games", vs or coop, easy or complex...? Card games â€“ especially the ones that make you wanna kill your friends. What music genre do you generally enjoy the most when it comes to live gigs? What's your favourite Monty Python song? Lately, when my computer died, my dad repaired it, and made a copy of my hdd, so I don't have to worry about losing my stuff. Besides, now it's working much better than before, so yay! If you had a spirit animal, what would it be, and why? Mine would be an Owl, they are the symbol of wisdom and intelligence, for which I strive for, they are nocturnal creatures, and 100% carnivores, just like me. Romulus, Remus, Mowgli, George of the Jungle, Tarzan and Etc: Best fictional feral child? What is your favourite cuisine? I'm old fashioned and use a lot of :) to make my sentences look more friendly. But :o is also one of my favorites. What colors do you prefer in your room / apartment (walls, furniture,...)? Grey as a base with red highlighting. Brings energy and all that. What common superpower is really a curse? I'd say Immortality/super regeneration. Sure, your body and organism never deteriorates, and instantly regenerates, but while you live on, you watch your loved ones grow old and die. Plus, if you already lived for a couple of hundred years on earth, you witnessed enough wars, epidemies and natural disasters to give you a monstrous PTSD, with which you need to live forever. Just look at our boy Logan here. Is he immortal? Practically, yes. Is he happy about it? Absolutely not. Do you like your peanut butter smooth, or crunchy? Smooth. Crunchy peanut butter is just unfinished peanut butter. Actually I tend to do things for procrastinating which are kind of useful, like suddenly tidying parts of my room I haven't touched in months. Or I start some kind of stupid new project like designing a PokÃ©mon Go Raid Boos chart with Photoshop... or an Excel table for my board games... My motivation to start with new things is at top when I have more important other things to do. And surfing on the internet of course, but I guess I do this all the time anyway, so it doesn't count. If you could enhance only one part of your body with superpowers of your choice, which one would you choose? I would gladly pluck my useless blind left eye out, and replace it with a cybernetical eye, with a night vision option. Did you had a dream you fullfilled after many years? This year I finally had the Double Down. It was delicious. Do you go sock-shoe, sock-shoe or sock-sock, shoe-shoe? Sock-Sock, Shoe-shoe. Except when I stay in home, I rarely wear socks, and I don't ear shoes, except for my crocs. Speaking of which, Crocs, comfy footwear, or shoecobbler's nightmarish abomination? I wear them as if they were slippers, in the privacy of my house, but going outside, I put on my normal shoes. I think crocs are really ugly... Perhaps they'd be useful at a pool, but I don't own any. At home I only wear socks. And when I go outside I wear sneakers. Shower in the morning or in the evening? You have been stranded in an unkown, uncivilized territory, with some tools and food. What is your first move? My first move would be to hide my food from animals and to climb the highest spot I can find. Then I'd look for signs of civilization and fresh water. Even if I have some food I guess water is the key to survival. If there isn't any to be seen I'd build something out of wood and leaf to take my supplies with me and start walking into one direction until I find water. But of course I'd leave a sign in case somebody searches for me. As a child my favorite book was Jules Verne's "The Mysterious Island". I should read it again for some survival tips.